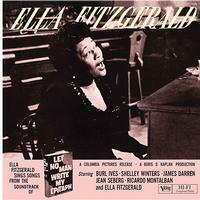 Considered one of Ella's greatest recordings, she's backed on this 1960 release by pianist Paul Smith. Let No Man Write My Epitaph was a 1960 Hollywood movie featuring Fitzgerald. The album hits at a depth of emotional understanding that critics often complained was missing in Ella's reading of jazz lyrics, and once again establishes her as one of the supreme interpreters of the Great American Songbook. Customer Reviews (5.00 Stars) 2 person(s) rated this product. I put off buying this for some time. I own many Ella records as well as the Ella- Armstrong albums. I put off buying because I never heard it before and I did not want to spend the $50. I was wrong .This is spectacular. This pressing is superb. I've never heard the first pressing and I don't need to. This pressing has presence and passion in every note. i have # 296.